Even though folk in nearby towns such as Wokingham and Reading had all the basic utilities from the early 1900s - gas, electricity, water, main drainage and sewage - villagers in outlying communities had none of these modern conveniences (or 'mod. cons.') until at least half-way through the century. Of course, the large estates of course had their own private power supply. Back in 1911, Bearwood even had its own gas works located near its gardeners' cottages, plus two 'engine houses' to generate electricity. Newlands also had an 'engine house'. 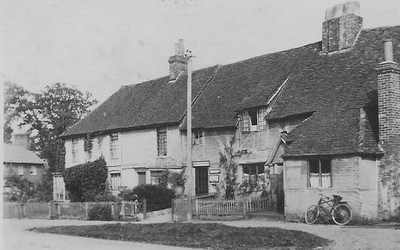 Arborfield Hall generated hydro-electricity and even Arborfield Grange had a generator before WWI. Bearwood Mansion used petrol generators from very early in the 20th Century, but frequently had to call for a mechanic from the motor garage that used to be in Broad Street in Wokingham to get the generators started. It's apt that the National Grid now has its national control centre in part of the Bearwood estate, at St. Catherine's Lodge. 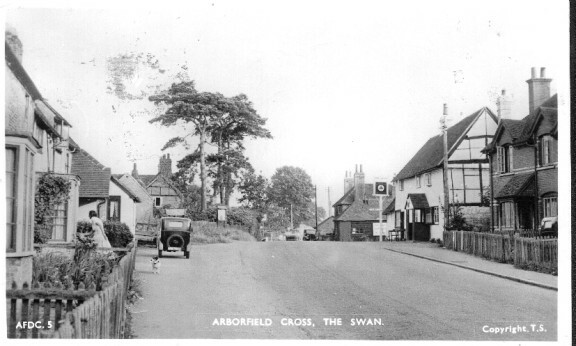 Residents of Arborfield and Newland lacked mains water until the mid-1930s. In 1933, a pumping station was opened in the grounds of Arborfield Hall with a reservoir on the Bearwood Road. 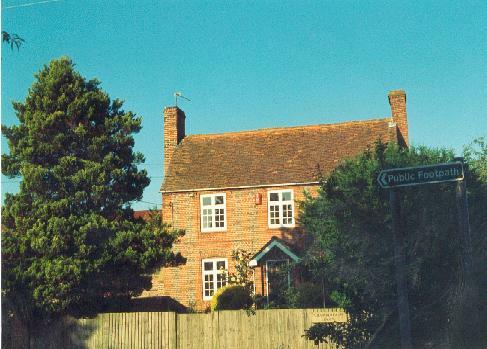 Even then, it took years before the public wells had all been made redundant, and in 2011 at least one house in the village centre still relied on a septic tank rather than connection to mains sewage. Electricity had been supplied to the Remount Depot for many years, but the villagers who worked there had to rely on candles and oil lamps in their own houses. Arborfield's Move to Obtain Electricity. The clerk of the Arborfield Parish Council forwarded a reply received from the Thames Valley Electric Supply Co. regarding the possibility of an electricity supply in Arborfield. The company explained that the Council's query to the Central Electricity Board had been sent on to them, and they pointed out that the grid lines were for the purpose of carrying electricity in bulk over large distances, and not for retail supply. The company had under consideration schemes for supplying Arborfield at a future date, but at this early stage they were unable to say when those schemes would be carried out. In the covering letter the parish council said the distant date mentioned by the company might be a very distant one, and they asked the District Council to use their greater influence in the matter. The chairman said a similar position had arisen in Hurst, where one half of the village was supplied. Representations to the company had so far not produced any results. There should be cables along all roads where a reasonable number of houses had been erected. The clerk was instructed to write to the company on the matter. The parish council was right; the 'distant date' turned out to be much later than it had hoped. Again, it was the Army that had electricity for its residents who started moving into new houses at the Army Technical School in 1939 , but some of the civilian workers living in the council houses alongside it had to wait until the mid-1950s to catch up. 1939 was the year that the local train service from Wokingham and 'Winnersh Halt' was electrified. The Southern Railway had for several years taken advantage of low-cost loans for capital projects that relieved unemployment, and their electric service had spread gradually through Surrey and Berkshire until it finally reach Reading. The Great Western was also exploring the electrification of suburban lines from Paddington to Reading (which it was reported in 1937 could be provided for only £90,000). World War II changed everything , and made such schemes a much lower priority for many years hence. On the domestic front, we do have a good idea of how far mains electricity had spread, thanks to the 1947 Auction Sale document for the Newlands Estate, and also the Annual Parish Meeting Minutes. Residents living at Nos. 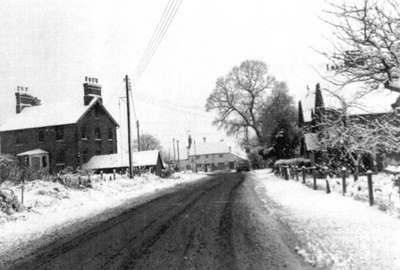 15 - 24 Council Houses (near the Bramshill Hunt) asked at the 1952 Annual Parish Meeting (APM) when they would be connected to Mains electricity, and repeated their plea in 1954. They finally achieved their aim a year later By the 1956 APM, the Parish Council Houses in Greensward Lane had received mains electricity - but their days were numbered. They were condemned within 6 years. Local power lines extended from Winnersh to Newlands, and so the main Newlands Mansion had its own mains electricity. Also, Newland Farm had mains electricity and gas 'installed by the tenant' (Herbert Lee). 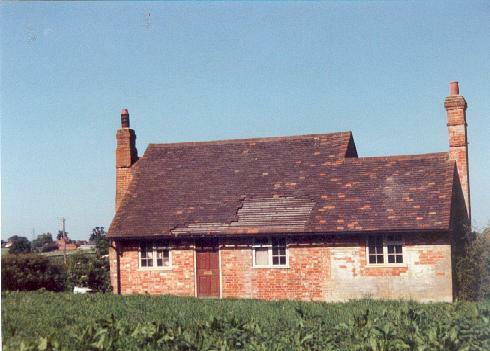 By 1952, when the farm was finally sold, it received a rent (called a 'wayleave') from the Southern Electricity Board for the posts carrying the power supply from Mole Road via Newlands to the farm, with a spur to Church Lane . 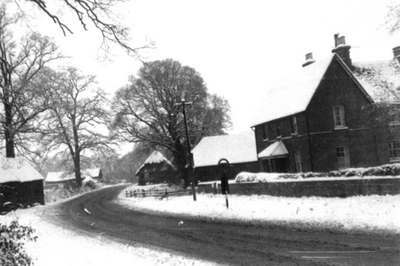 Newland Farm under snow, around 1960, from a series of snow scenes in the 'Swan Photo Album'. What 'mod. cons.' did the other properties in the 1947 Sale document have? Only one other property on the Estate was known to have electric lights - and that was 'The Glen' (now known as Cordery Cottage, off Mole Road). Lot 4 also had well water, pumped to the house by a semi-rotary pump installed by the tenant, Mr. Cordery. On the other side of the lane from the cottage is the post carrying the electricity supply, and equipped with a transformer. 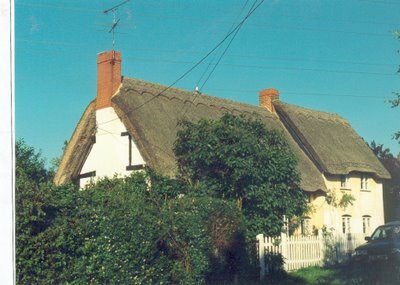 No doubt it was much easier to connect this cottage to mains electricity than others of the Newlands Estate. 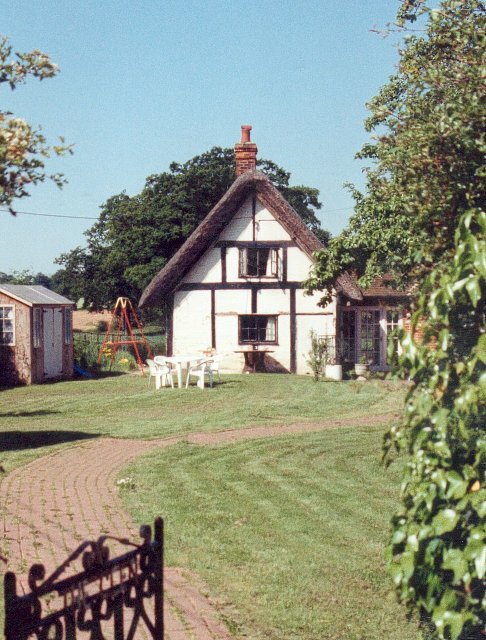 Closer to Arborfield Cross, Lot 5 was a 2-bedroom cottage with outside washroom and E.C. ('Earth Closet'), let rent-free to Mr. Lyford for life. Water was supplied by the Newlands Estate. Lot 6 , known as 'Hill Cottage', had two bedrooms and a scullery, with water supplied by the Estate. It was rented out to Mrs. Budd. It had been left derelict for many years, but in 1994 (as shown here) it was almost habitable again, and in subsequent years it has gradually been enlarged. Lot 7 , known as 'The Poplars', had 4 bedrooms and a bathroom with bath and basin, but only an outside toilet containing an 'Elsan'. The Estate supplied the water. 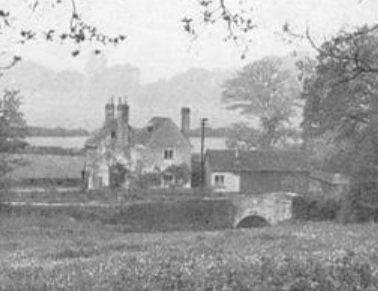 This photo was from the 1947 Sale catalogue, and shows the old bridge on Mole Road. Lot 8, Chamberlain's Farmhouse, had been used as the Estate Laundry, and had water supplied by the local water company. It had 3 bedrooms, a sitting room, kitchen, scullery and 2 rooms formerly used as the laundry - but no bathroom and no electricity. Lot 12, 'Sunrise', had 4 bedrooms, 2 sitting rooms, kitchen, larder and Company's Water - but no bathroom and no electricity. It was let to Mr. Druett. This photo was taken in 1994, long before the extensive garden had been divided into two plots and the house had been extended to the rear. 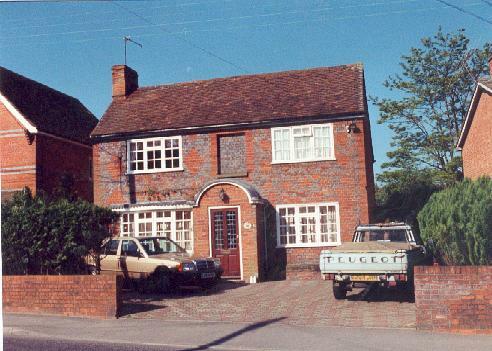 Lot 13, 'Mileham Cottage', had 4 bedrooms, 2 sitting rooms, kitchen and scullery and "Companies' Gas and Water" - but no bathroom and no electricity. It was let to Miss Tayler, whose family had been tailors in Arborfield for generations. Between Mileham Cottage and 'The Swan' are the two farm cottages that formed part of Lot 2 (Newland Farm), 'each containing three Bedrooms, Sitting Room, Kitchen, Larder, Washroom and E.C.' Although Mains Water and Gas were connected, the tenants had no bathroom or electricity. They can be seen on the right of this Frith's postcard. 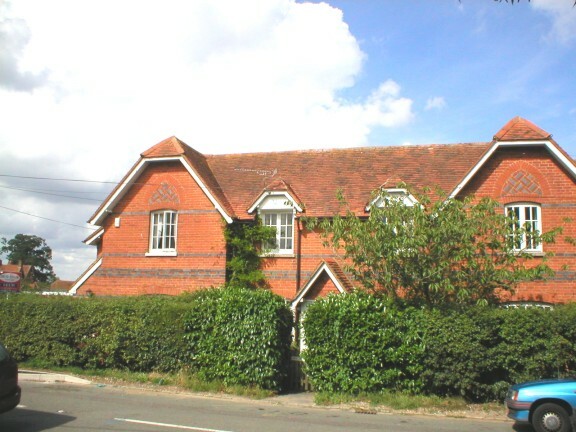 Next to the old Post Office was Lot 14: a "Block of Brick and Tiled Cottages, one containing three Bedrooms, two Sitting Rooms and Kitchen, and the other three each having two Bedrooms, Sitting Room and Kitchen. Pump Water. Gas connected. Gardens." No electricity or bathrooms, though. In this old postcard, the then Post Office was to the right of the block of now-demolished cottages, while 'Lanka House' was to the left. What later became 'Lanka House' is shown on the left of this photo from the 'Swan Photo Album' . The dark brickwork has been replaced by rendering, which covers all but the top window on the side wall, making the house look quite different. Lot 16 was on the other side of School Road, and can be seen on the right of the black-and-white photo above. 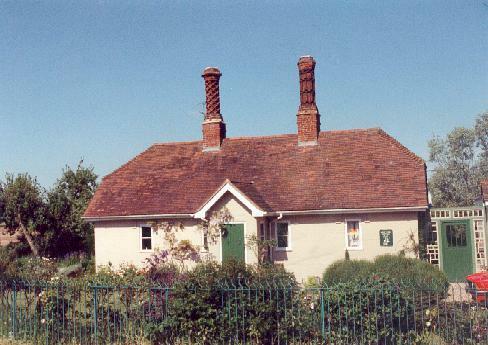 This 'Block of Three Brick and Tiled Cottages' was erected in 1878, and each contained three bedrooms, a sitting room and kitchen. Although they had 'Gas and Company's Water connected', they lacked electricity. One was let to Mr. A. Streak, while another was let to Mr. W. Streak and a third to Herbert Lee of Newland Farm. Lot 17 was a pair of 'Modern Brick and Tiled Cottages', each containing 3 bedrooms, sitting room and living room, plus outhouses. No other utilities were listed, though it was noted that the 'Landlord [was] paying rates, except water rate'. This photo was taken on 14th March 2004 when the Arborfield Cross junction was being re-shaped to become a large roundabout. 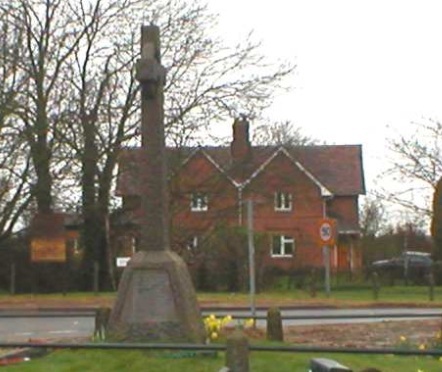 Soon afterwards, the war memorial was removed before being re-sited further to the east. 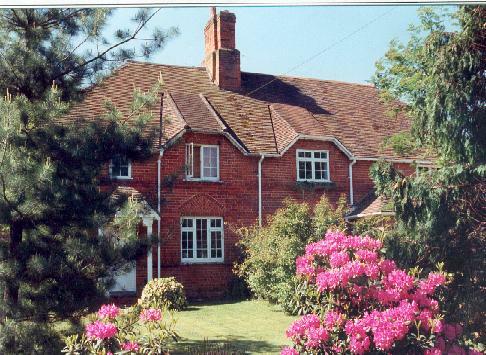 Lot 21 was then called 'Woodbine Cottage' , let rent-free to Mr Stephen Emblen for life. Along with three bedrooms and sitting room, it had a kitchen and mains water but no bathroom or electricity. By 1994, when this photo was taken, it had been extended and equipped with modern conveniences. Lot 1 included a semi-detached brick-and-tile house named 'Brook Cottages' plus thatched cottages next door (now combined into a single dwelling, 'Hunter's Point' ). Pam Slade remembered growing up at Brook Cottages in WWII: "Mum had to fetch 2 buckets of water daily from a pump in the field beyond the bridge. We had a ‘lav’ at the bottom of the garden; indoors I can remember a scullery in the corner of which was a stone boiler." By the 1952 sale - when the cottages were finally sold - the houses still lacked electricity, but the Sale document stated: "The Southern Electricity Board's main passes nearby." 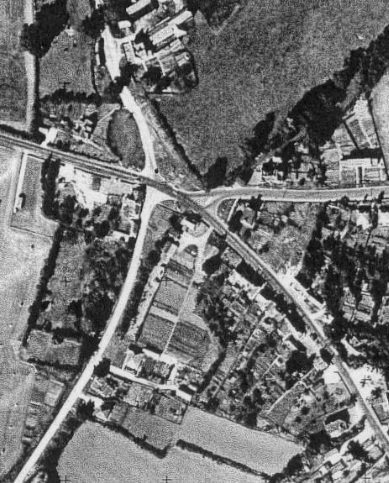 This 1961 aerial view of the 5-way junction at Arborfield Cross shows several of the lots illustrated above - see the map from the 1947 Sale document for more details. It also clearly shows the smallholding in Lot 10 stretching down Swallowfield Road from the junction. Lot 10 had a block of 3 cottages right by the junction on Eversley Road. They had mains water and gas but very little else, and were replaced by Nos 2 - 6 Eversley Road in the mid 1960s. Does anyone have good photos of them? 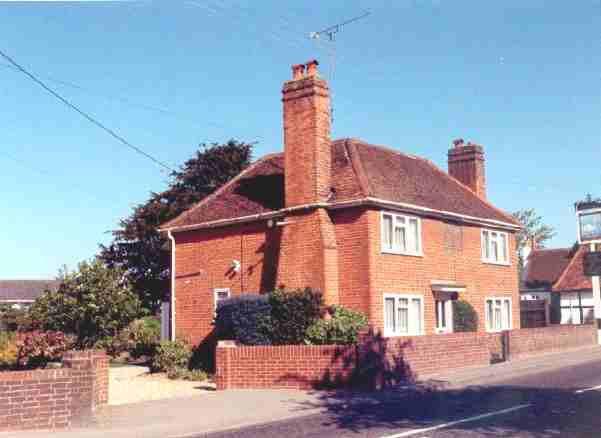 The cottages of Lot 19 (2 detached dwellings) and Lot 20 (semi-detached) further down along Swallowfield Road, all had 2 bedrooms and mains water. They have long since gone. Does anyone have good photos of them? Lot 21 (Woodbine Cottage) and Lot 8 (Chamberlains Farm) are just off this picture. [From an article in the ’Reading Mercury’, 5th June 1937]. “Railway Electrification in the Reading area” was the subject of an address given by Mr. Holmes Waghorn, transport consultant, of London, to members of Reading Rotary Club at their luncheon on Monday. President Frank Adlam was in the chair. Mr. Waghorn said railway electrification had played such an important part in the development of many towns in Southern England that it should be welcome news to tradespeople and residents in the Reading district that by July this year the Sunningdale-Reading section would be converted from steam to electric traction, giving a through electric service to and from Waterloo. Certain Great Western electrification schemes now under consideration might in the near future result in the electrification of the Paddington-Reading route at a cost of £90,000. Even the most ardent advocates of other methods admitted that electrification afforded the only means of providing a really adequate service with satisfaction to the public and profit to the railway on crowded suburban systems. “Already there is a certain amount of building going on, on the outskirts of Reading”, continued the speaker. “With a clean, fast and frequent train service such as the one I mention, can you imagine the number of people who would decide to make their homes at or near Reading? The number of season-ticket holders who would travel to London daily from Reading would soon rival the number of Brighton season-ticket holders. Land values would increase, building activities would be redoubled, and careful control by the local authority would ensure that only suitable development took place. The prosperity of Reading tradespeople would take an upward trend with increased residential population.